Nitric oxide (NO), the first gas known to act as a biological messenger, is one of the most widely studied free radical/gas in medicine, both for its biological function and therapeutic applications. The measurement of endogenous NO in exhaled air is widely used in the evaluation of lung disorders. Partitioning of exhaled nitric oxide (eNO) is of increasing interest because of the additional information about lung pathology and distal lung inflammation that can be obtained. 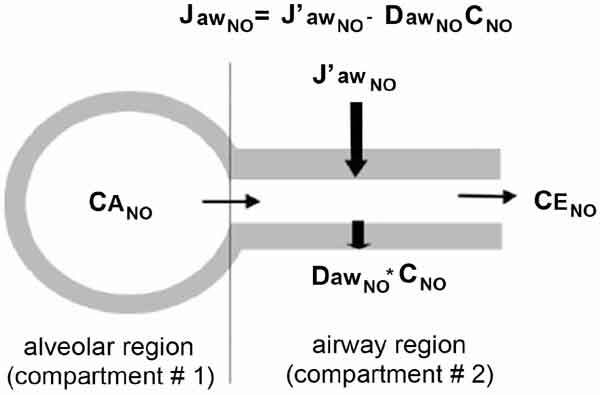 Specifically, measuring exhaled NO at multiple flow rates allows assessment of the flow-independent NO parameters: alveolar NO concentration (CalvNO), bronchial NO flux (JNO), bronchial wall NO concentration (CWNO), and bronchial diffusing capacity of NO (DNO). Several studies have reported that there were different patterns of those parameters in different airway diseases and/or in different severities of the same disease, mostly in asthma. Specifically, while JNO seems to provide the same information as FeNO50, alveolar NO concentration appears to be an independent parameter that is putatively associated with increased distal lung inflammation and more severe disease. However, despite much research interest in partitioning exhaled NO, clinical usefulness has yet to be established. Alveolar NO concentration, Bronchial NO flux, Bronchial wall NO concentration, Bronchial diffusing capacity, Exhaled nitric oxide, Two-compartment model.